Hydraulic connections mate pipes, hoses or tubes together or to components such as cylinders, pumps, valves or ports in other equipment. 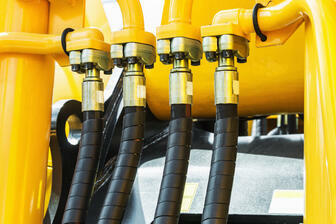 They are used to complete a leak free hydraulic fluid system. These components combine to ensure the system is free of leaks or other failure under high pressures. Because of certain connection configurations and applications, flange fittings or separate flanges are the best or sometimes the only practical solution to make an efficient and leak free connection. Flange connections are typically used in applications that will encounter exceptionally high pressures when using pipe or tubing with an OD over 7/8 inches. They may be bolted together to mate two sections of pipe (tube or hose), or bolted or screwed into the component to secure a flange fitting or section of pipe. Flanges can also be disassembled for easy access to modify, clean or inspect the system. Certain flanges may also be permanently welded together or to the port section of the component (motor housing, valve port, etc.). More commonly, a flanged joint is made by bolting two flanges together with a gasket in-between to ensure a secure seal. The hydraulic flange standard is ISO 6162, which includes SAE Code 61 and 62 or SAE J518 UNC thread North American Standard, along with International standards with metric threads.